Fears of finding themselves in hot water is certainly not something this company's investors need to fret over. Cutting-edge technologies and revolutions in biotechnology often steal the headlines when it comes to the most exciting stocks. But conservative investments belong in any portfolio. And between its financial health and growth potential, Aqua America (NYSE:WTR), a leader in the water utility industry, offers investors a sound investment. Although Aqua America's stock, which has climbed 83% over the past five years, hasn't kept pace with the growth trajectories of some of its peers -- American Water Works (NYSE:AWK), for example, has risen 132% during the same time period -- it has beaten the S&P 500, which has risen only 68%. Looking toward the future, Aqua America's investors can enjoy the peace of mind that they won't be finding themselves in deep water any time soon. One of the reasons why investors are attracted to utility stocks is because of dividends. Utilities frequently operate in regulated markets. With these consistent revenue streams, they also have clarity into the future. This affords them the ability to efficiently manage capital and regularly return it to shareholders. Of course, there's no guarantee that a company will be able to execute this. Aqua America's investors, however, can rest assured that their company is in good hands. Over the past five years, the company has maintained a fiscally responsible payout ratio of 52.4%. Investors also want to see dividend growth. Aqua America has proven its commitment in this regard. From 2006 to 2016, Aqua America's dividend has grown at a compound average growth rate (CAGR) of 7.6%. 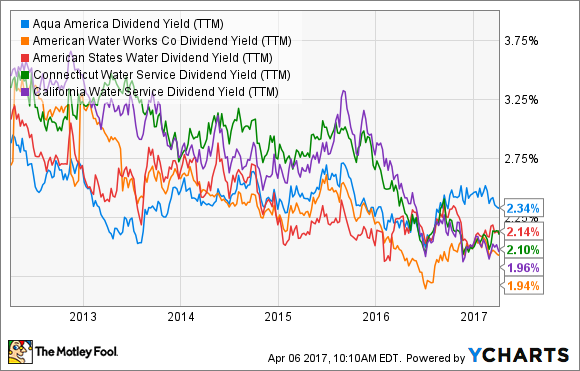 Currently, the stock sports a dividend yield of 2.33% -- an impressive amount compared to its leading peers: American Water Works, American States Water (NYSE:AWR), Connecticut Water Service (NASDAQ:CTWS), and California Water Service (NYSE:CWT). WTR Dividend Yield (TTM) data by YCharts. One of the most pressing concerns for water utility companies is maintaining a sound infrastructure -- transmission pipes, treatment facilities, etc. This ensures efficient operations, which, in turn, provides better margins. In order to do this, it's important for them to keep sound balance sheets, so they don't find themselves drowning in debt. Aqua America's shareholders, in this regard, have little to worry about. The company, which reported $392 million in capital expenditures (capex) in fiscal 2016, forecasts capex spending to total more than $450 million in the current year. 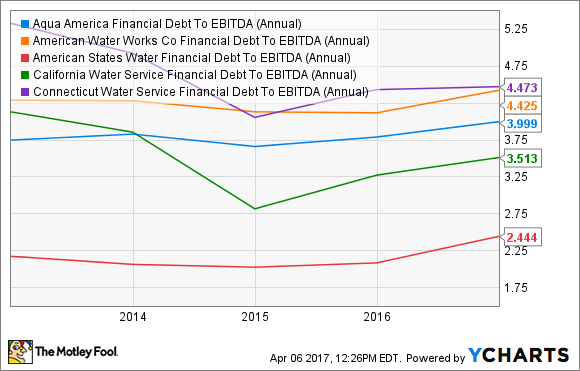 In financing its capital expenditures, Aqua America relies more on debt than its peers -- its debt-to-capital ratio of .51 is higher than all of the above-mentioned peers -- except for American Water Works, whose ratio is .58. WTR Financial Debt To EBITDA (Annual) data by YCharts. But this shouldn't cause investors any distress since the company seems adequately prepared to service its debt. In assessing the company's leverage, we find its net debt-to-EBITDA (earnings before interest, taxes, depreciation, and amortization) ratio raises no red flags. Increasing Aqua America's return of cash to shareholders and practicing effective upkeep of its infrastructure requires revenue to grow at a decent clip. Considering the company's recent performance and what it sees on the horizon, investors should be kept at bay. All figures above, except for earnings per share, reported in USD millions. Data source: Aqua America 10-K.
Aqua America can't simply raise prices when it deems necessary, so it relies on filing requests with public utility commissions. In Pennsylvania, for example, which accounted for 52% of operating revenue and 74% of net income in FY 2016, the company intends to file an infrastructure investment charge this year. A rate increase is likely in 2018, with resolution expected in 2019. Additionally, the company relies on its growth-through-acquisition strategy. In addition to further diversifying its customer base, these acquisitions position the company to grow revenue, increase the efficiency of its operations, and ensure that it's well suited to maintain dividend growth. In its recent 10-K, for example, management noted the company has expanded its "utility operations by completing 84 acquisitions or other growth ventures." In FY 2017, Aqua America anticipates closing on four acquisitions that will add almost 9,000 customers. Looking to the future, investors can monitor Aqua America's commitment to keeping its infrastructure in good shape. The company forecasts capex spending to total $450 million in fiscal 2017. And because it plays so vital a role in the company's growth strategy, investors should confirm that the company is continuing to complete acquisitions. With responsible management at the company's helm, though, investors can rest assured that Aqua America will execute this in a responsible manner.